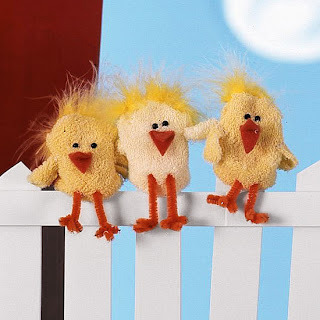 Break out the crafts supplies and try these fun Easter projects the kids can enjoy (with adult supervision, of course!). 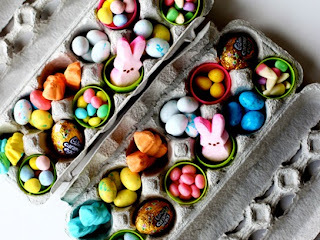 From pinatas and puppets to spoon candy and Easter bags, the whole family will get into making these easy Easter crafts. 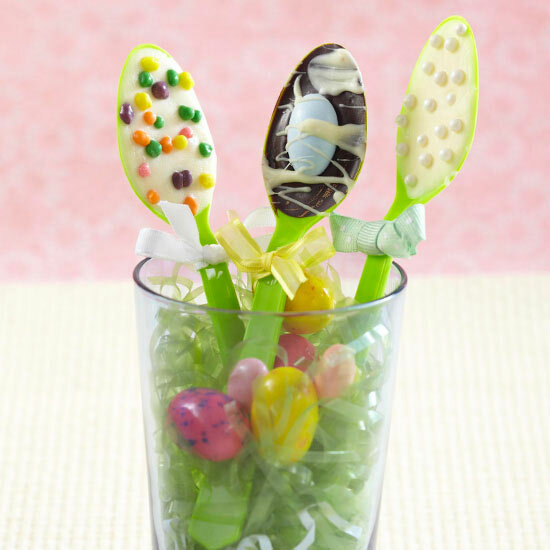 Sweet candy spoons are the perfect treat for after Easter dinner, and kids will love getting creative with making their own. 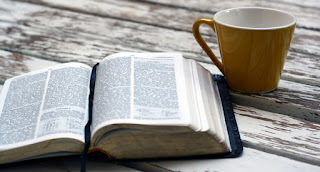 Adults should take charge of melting both milk and white chocolate; once the chocolate is melted, pour just enough into each spoon so it doesn't spill over but is full. Drizzle leftover melted chocolate across the spoons for an added decorative effect. Have kids sprinkle spoons with small Easter candies, then put in the fridge for 15-30 minutes to set the chocolate. 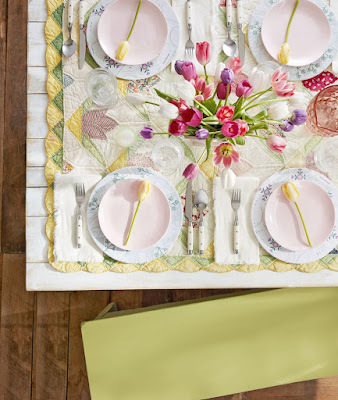 Once the spoons are set, tie a small bow around them and set them in a glass at the Easter table to double as decor. 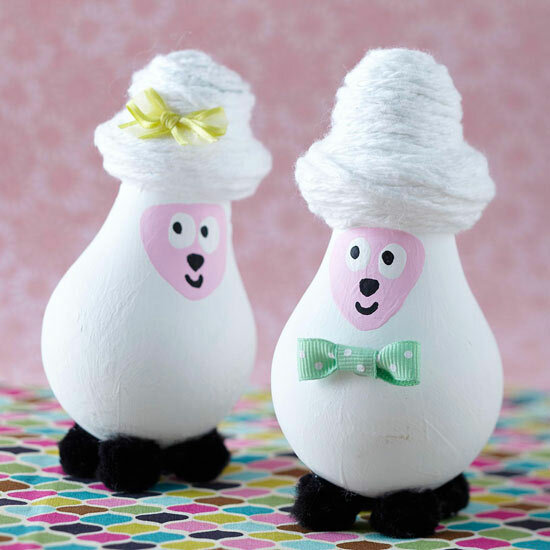 These little lambs are an adorable way to recycle burnt-out lightbulbs -- and you don't need many supplies to get them looking their best! Paint a standard lightbulb white and let dry. 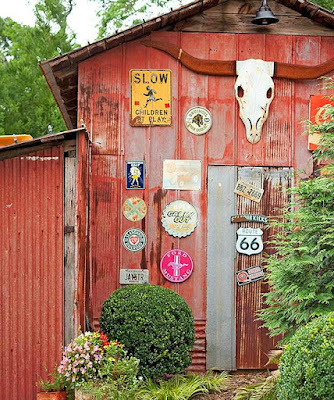 Add a face with pink paint, and then more facial features with black and white paint. Wrap the metal screw top with white yarn to give the sheep a hat, then glue on black pom-poms for the feet and finish with a bow. Let kids decorate their lambs with other crafty embellishments, such as glitter or paint, if desired. 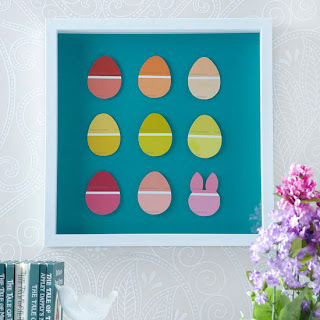 This pretty Easter artwork can be made on the cheap with free paint chip samples from home improvement stores. 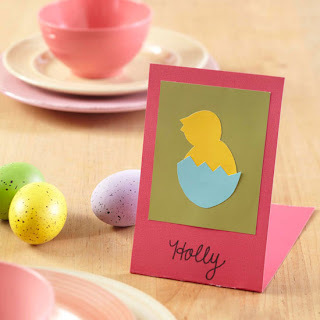 Have kids pick out a variety of colors to use, then cut them out using an egg and bunny templates. 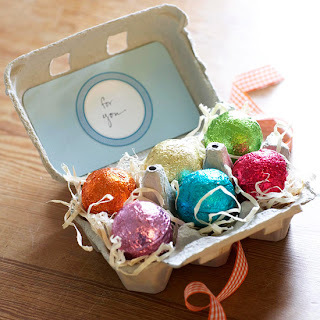 Attach the paint chip eggs to a 12x12-inch piece of scrapbook paper with adhesive foam dots. Frame the paper and hang for a so-simple crafty Easter decoration. 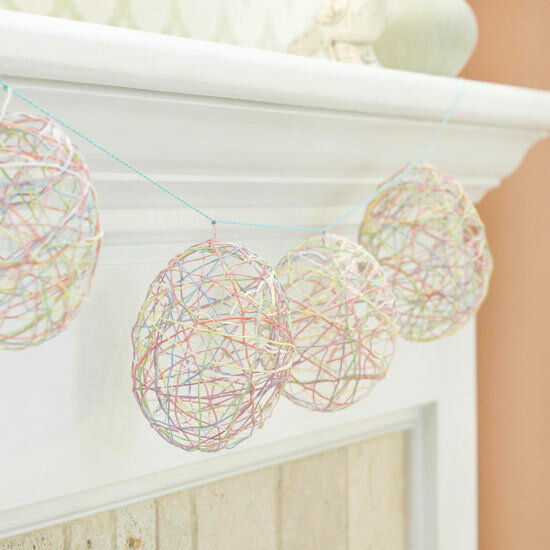 For a family-friendly project, try this easy garland of embroidery floss Easter eggs. Prepare a bowl of stiffener mixture (we used 1 cup of liquid starch mixed with 1/2 cup of flour) and gently coil embroidery floss into the bowl. Blow up a water balloon to the desired size of your egg, and wrap the floss around the balloon, using multiple colors if desired. Let the finished product dry for several hours, then pop the balloon to reveal your egg. 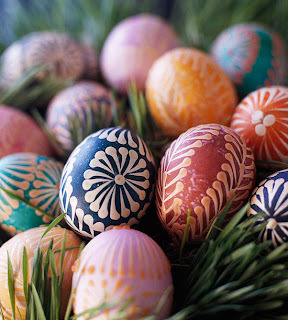 Hang several eggs with another strand of floss by tying the floss to the top of each egg. 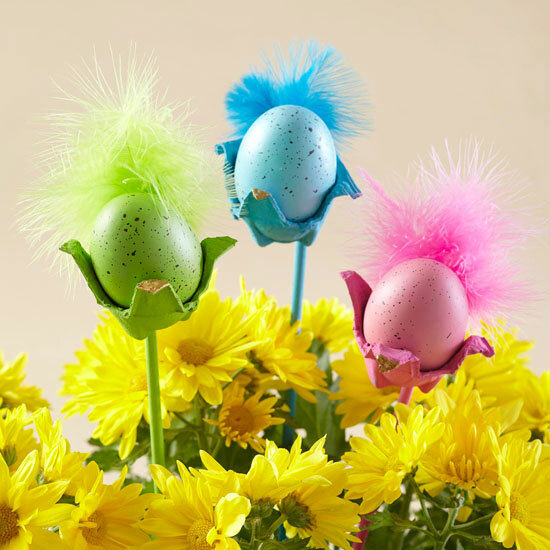 Transform recycled egg cartons and plastic eggs into peeping birds for a simple flowerpot decoration. 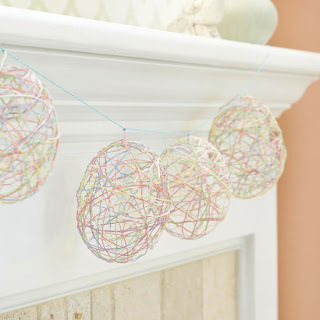 Paint single egg-carton cups and wooden dowels in bright colors; let dry. Glue each dowel to the back of the egg cup, then glue a plastic egg into each one. Add a matching feather to the back of each bird, and paint a corner of the egg cup gold or yellow to make a beak. All it takes is a little cutting and folding to make this sweet chick place card for your Easter table. Fold a 4x12-inch strip of heavy scrapbook paper or cardstock in half lengthwise. Tape a smaller piece of paper to the front of the strip. Cut out our chick and eggshell patterns in coordinating colors, then tape to the place card. Write each guest's name below the chick with a pen or marker. 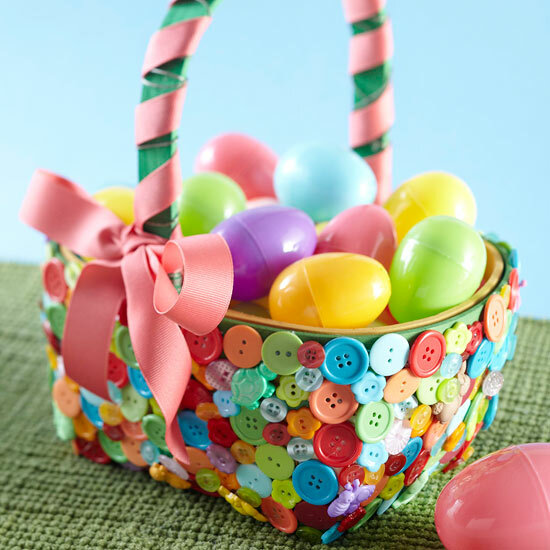 Dig through your spare button stash for this so-easy Easter kids' craft. Choose a simple wooden basket, and glue buttons in all sizes and colors onto it for a unique and colorful look. When you're finished, let the basket dry completely, then wrap a bright ribbon around the handle and tie a bow for a finishing touch. Made from yellow baby socks turned inside out, this chirping set of baby chicks is an adorable Easter craft that will delight little ones on Easter morning. Treat the Easter hostess to a little pampering. Fill an empty egg carton with fizzy bath balls for a thoughtful Easter gift. Cover the carton top with pretty paper and tie with ribbon. For a unique twist on the traditional Easter egg, give eggshells second life as planters. Fill the planters with different types of plants, such as these colorful alyssum seedlings. 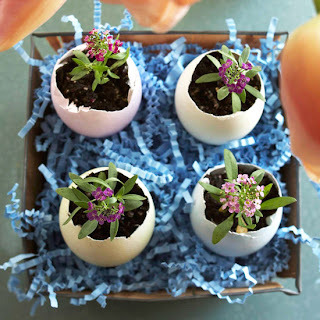 Involve the kids in planting and caring for the little Easter garden. 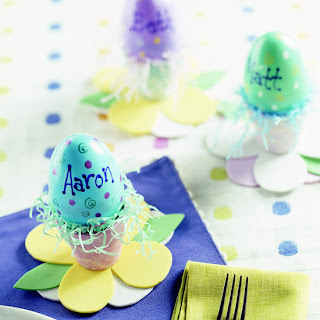 Personalize and decorate plastic Easter eggs to use as quick and cute placeholders for your special guests.